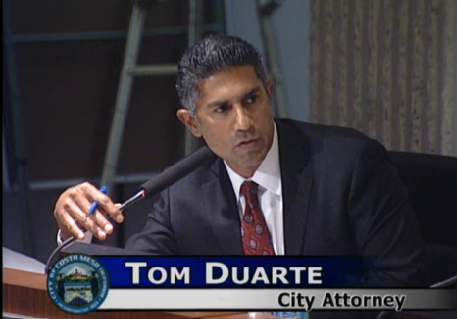 The text of the initiative is presently in the hands of Costa Mesa City Attorney, Tom Duarte, who will provide the title and summary necessary to proceed with the next step. At some point in the very near future, depending on how the rest of this process moves along - probably near the middle of July - the proponents of this initiative will begin collecting signatures to authorize the placement of the initiative on the General Election ballot in November, 2016. According to the information provided to me, collection of signature may take up to 180 days. The proponents will need at least 5,000 valid signatures according to City Clerk Brenda Green. The proponents will likely try to gather 7,500 signatures, just to be sure. This initiative is similar to Newport Beach's Greenlight measure - one of the most contentious measures in the history of that city. This one has the probability of also being controversial, since it potentially has the capability of slamming the brakes on "excessive development" throughout the city. We'll know more when the actual initiative is available for reading. I can hear developer-oriented politican's heads exploding all over Mesa Verde as folks become aware of this initiative. And you thought they were only M-80s! It's going to be a very interesting summer and fall. Yeah, all that dough collected from developers and this is what happens. The brand went wrong. Now it's time to move forward toward sanity. Maybe Boss Hogg will move to another city now. Thank you Jay and Rick! I love that there are people that are listening to what the citizens have been saying, and are willing to the take the BULL by the horns to get this on the ballot. For too long, the Planning Commission and council majority has favored high density and out of town developers over long term citizens, the spirit of our General Plan and our zoning codes. I can't wait to read the text of this. I am not opposed to change or growth. Smart growth and beneficial changes will help our city for years to come. The definition of out of control growth is: cancer. Very happy that the out of control high density development will be halted, or at least slowed down. Once this happens, the council and the planning commission can't just give the finger to the residents. They will have to actually do the job they were appointed to do in order to get things done. Very proud. All volunteers are needed, I'm sure, to get this thing going. I'm in. This will hopefully stop a lot of people from being impacted with these ugly tenements next to their homes. Teresa, very true. There is plenty that does need to be worked on, such as Harbor Blvd. However, Harbor Blvd. should not be residential. It should be commercial, and not just fast food joints and car dealers. It doesn't need to look the way it does. Revitalization is development, but good development. And not with our "officials'" hands out to the developers. 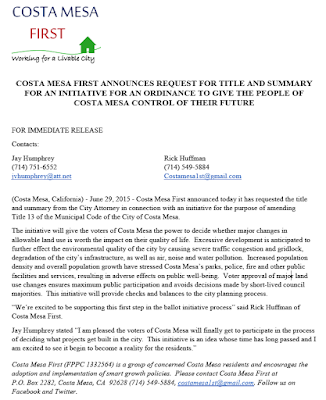 Many thanks to Costa Mesa First for putting forward this very important initiative. 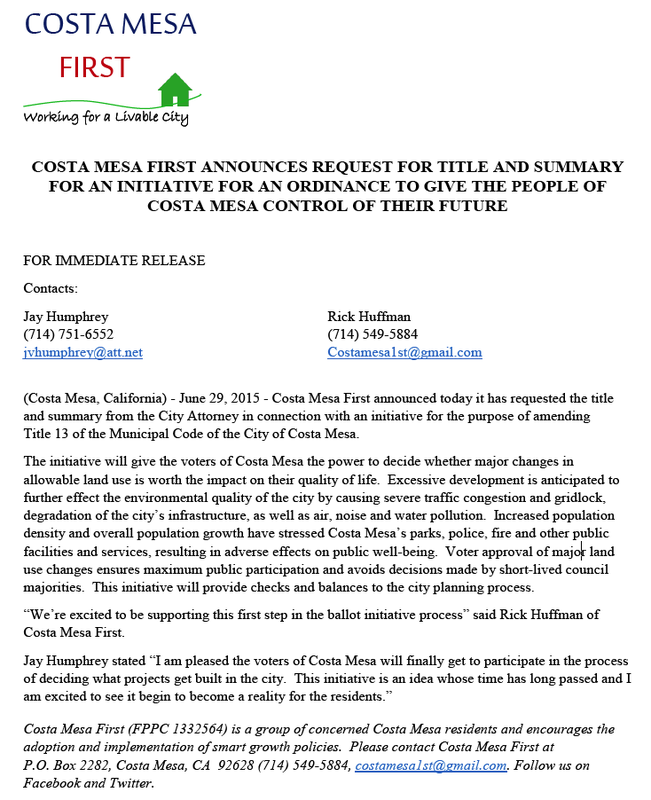 It will provide much-needed transparency and a chance to have a voice in what matters to Costa Mesa residents the most: our quality of life. Dan and I will help. Hip Hip Hooray! Hip Hip Hooray! Hip Hip Hooray! Thank you Jay and Rick and Costa Mesa First! Can't wait to read the initiative and start walking to gather those 7,500 signatures. I've got my walking shoes on. Where do I sign up? A possible ray of hope for CM? Wonder how the true "haters" will tie this to the "Unions"? And how often theyl'll throw out the "anti/no growth" lingo in their attempts to keep this highly necessary initiative from passing?